BOOKTRYST: How WET Can You Get? 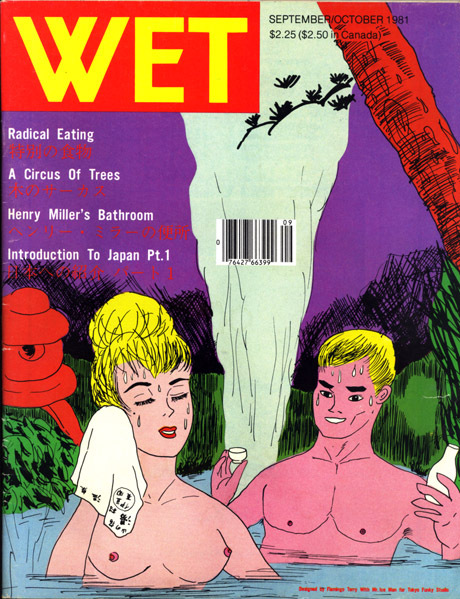 WET: The Magazine of Gourmet Bathing (1976–81), was a pioneering example of a California “lifestyle” magazine that was as much about the design and packaging as about the content. There were ads that looked like editorial content and vice versa. 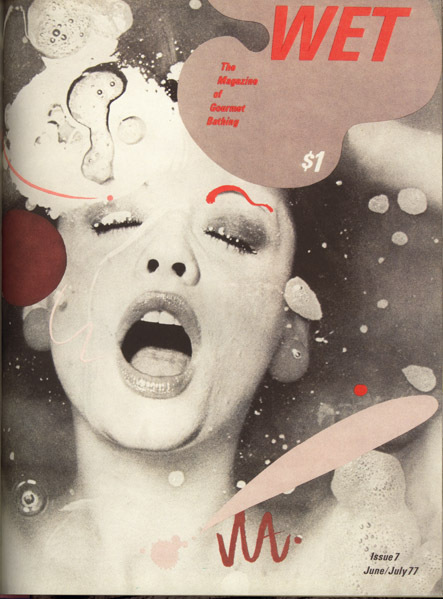 Ostensibly about bathing, it ran from 1976 until 1981, when the editor, Leonard Koren, left Venice, California, moved to San Francisco and then to Japan. The influence of Japanese culture increased steadily in the US, particularly the West Coast states, after the Second World War. Zen Buddhism was an important element, but so were the graphic arts. And there is the Japanese tea ceremony. “The Japanese tea room – despite its very appealing form and philosophy – was too culturally specific for the vague purposes I had in mind,” said Koren, who was a former architecture student looking for a direction. Koren wanted to create some kind of visual expression that was not in the mainstream. He had been thinking about bathrooms as important but overlooked places that were private and cleansing: they had illumination, heat and water. They involved nakedness and contemplation. He had used images of bathers in a series of artworks, and came up with the idea of a magazine about bathing. His magazine was to be about enthusiasms, and since California is about extremes, he though he would create a parody of enthusiasts. His inspiration was threefold, first there was Vogue which he saw as dogmatic, full of bombastic bluster and grand pronouncements about fashion, such as “BROWN is the new BLACK!” Then there was Andy Warhol’s Interview magazine, which was a compendium of beautifully presented drivel by self-important minor celebrities; and thirdly, there was Gourmet, a foodie magazine which featured pretentious articles about meals. Koren liked the idea of a tongue-in-cheek combination of all three, a “Magazine of Gourmet Bathing,” that was and was not about bathing: mud baths and soaps can only hold your attention for so long, but pretty much anything could work in the context. He started working on WET and delivered the magazine to friends in Venice Beach and Santa Monica, networking to sell ads or find contributors. 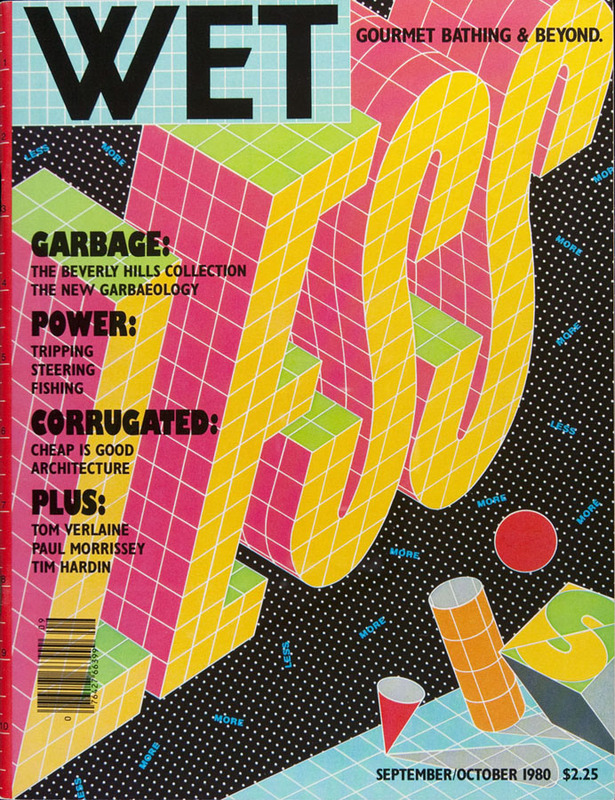 In April 1977 he met the designer Tom Ingalls who had design world connections to photographers and graphic artists, that would improve the look of the magazine from a funky typewritten fanzine into something with more polish. At the time Ingalls was going through a break-up with his girlfriend April Greiman, and Koren hoped they could get along long enough to get the April/June issue of the magazine done. Greiman was on the verge of becoming one of the key figures in the LA design world. Her background was in textiles and she had gone to Basel, Switzerland, to study at the Art School there, but the faculty had plugged her into a series of courses in typography that were to transform her interests. She took the Swiss style she had been schooled in, and elements of Russian Constructivism she had picked up in Europe, and deconstructed them, leading to a postmodern style in American design in the 1980s (popularized, for example, on record album covers from Los Angeles-based labels). The magazine took off (events at bath houses created a buzz in the press, followed by television interviews in hot tubs, and Mademoiselle editors coming to mud bath parties) and attracted a lot of talented Angeleno artists: designers John Van Hamersveld, Taki Ono and Rip Georges, cartoonists Matt Groening, Futzie Nutzle and Gary Panter, photographers Herb Ritts, Raul Vega and Jayme Odgers. 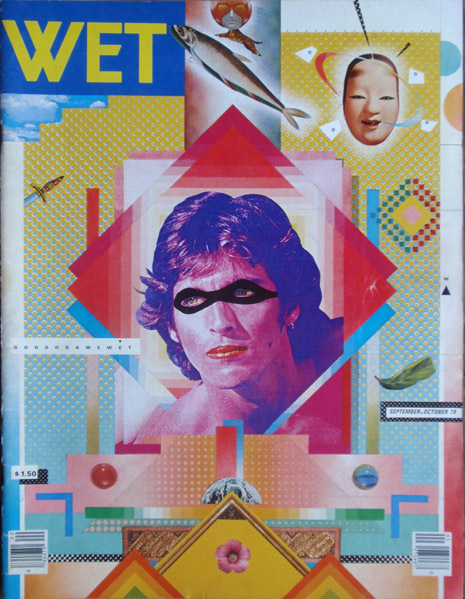 Some at the start of their careers, lent their talents cheaply and helped push the boundaries of art and design that WET would become known for. Koren found the thematic approach (e.g., “Religion”) was a good solution to pulling an issue together. He persuaded poet Lewis MacAdams to move south from Bolinas and assume the role of editor, which he fulfilled excellently, bringing in another range of literary connections, including William Burroughs’ essay “Is language a virus?” An article on necrophilia created a furor – and sold copies. Koren was well-networked. He dropped in on Noel Young in Santa Barbara and got a copy of Henry Miller’s essay “On Turning Eighty,” which ran in the magazine, as did an article on Henry Miller’s bathroom (Sept/Oct 1981). Fashion and music joined the regular contents. Kristine McKenna brought interviews with musicians that had uncensored language and ideas, making them unfit for more mainstream media. WET caught the Zeitgeist and was light and ephemeral, not predictable or ponderous. The ads blended into the editorial content and vice versa, creating a unified style, which is always desirable in a magazine. The successful marketing of the Californian lifestyle, particularly in the context of water, was a trend that continued with Beach Culture (late 80s) and Ray Gun (Santa Monica, 1992–2000) magazines, designed by David Carson, that were also essentially pointless, but graphically far less interesting.